This week, we’re bringing you Tim Ferriss like you’ve never heard him. Ferris has been a man on a mission, driven to deconstruct mastery and excellence, then share what he’s learned. It began with his own relentless experimentation and documentation, which yielded #1 New York Times bestsellers The 4-Hour Workweek, The 4-Hour Body and The 4-Hour Chef. In more recent years, though, this yearning has led him to sit down with hundreds of elite-performers, from a vast array of domains, on a quest to reveal what made them them. These conversations are shared weekly on Tim’s award-winning podcast, The Tim Ferris Show. We recorded a Good Life Project conversation with Tim earlier this year, which you can listen to here. In today’s conversation, we go in a very different direction. Tim actually lost a number of people this year, turned 40 and found himself in a deeply contemplative and emotional space, thinking about who he is, how he wants to create the next 40 years of his life and what matters. 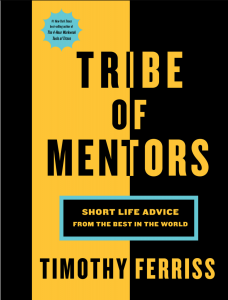 This all led him to seek out wisdom from many of the world’s greatest thinkers and achievers, which he’s condensed and edited into his latest book, Tribe of Mentors: Short Life Advice from the Best in the World. In this week’s conversation, we drop into the deep end of the pool quickly. When we sat down with Tim, he’d recently returned from an intensive 10-day silent meditation retreat. While gone, he lost yet another close friend. He was, in his own words, in an incredibly “porous” place, leading more from the heart than the head, which is a bit of a major turnaround for him. We spent time deconstructing Tim’s 10-day silent meditation experience, his struggles and awakenings, how it compared to psychedelic experiences and how, barring one major saving grace, his retreat may have sent him spiraling into a very bad place. We also talked about his experience with death, his decision to append audio of his most recently departed friend, Terry Laughlin, which was recorded by Terry’s daughters in the hospital during his final days of life to the end of Tim’s recent podcast interview with Terry. Tim also shared his decision to take the TED stage, switching last minute to talk about something deeply painful and personal, and what that meant to him, his lens on legacy work (and how it landed with his family, who didn’t know what he’d be talking about). And, we explored Tim’s awakening to a “softer” set of metrics to measure a life well-lived and his evolving definition of what it truly means to live a good life. Tunein: Catch all-new episodes of some of your favorite podcasts early with TuneIn First Play? Download the free TuneIn app now. Videoblocks: Go to videoblocks.com/goodlife to get all the stock video, audio, and images you can imagine for just $149.